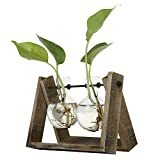 Vintage design planter with 2 mini bulb shaped vases with rustic style wood and metal stand. Ideal for air plants, water plants, terrariums, flowers or even artificial plants. Unique swivel design allows the vases to sway slightly. Approximate Dimensions (in inches): 5.75 H X 7.75 W X 4.0 D.
Rustic wood and vintage design, these decorative glass vases are perfect for adding a touch of green and elegance to your home or office. The holder features two light bulb shaped clear glass vases, perfect for letting air plants, flowers or water plants grow, building terrariums, or even decorative with faux plants. Both planters are held by a metal rod, allowing the vases to swivel. The translucent bulbs let you see how your plant roots are growing or allowing you to create a terrarium. Place it on your desk, windowsill, bookshelf or table, any place this decorative wooden planter with glass vases goes is sure to stand out.